This super thin 1.2" deep TV has non-localized LED backlighting in the sides of the panel. It is loaded with features – some pretty good and some not very useful. It's attractive and has some surprising picture attributes regarding light reception and contrast. Read the following review in depth to get a sense about whether this TV is right for you as you'll be paying a lot for extra features if not. HQV Benchmark:The TV tested very well in when we ran it through a series of processor video board testing. 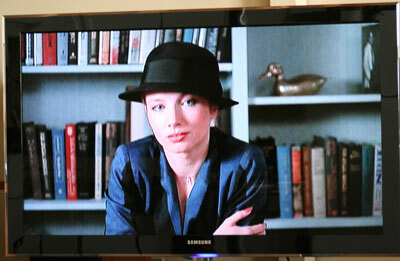 Rebecca Dimornay in the 1997 version of Risky Business. The 55B8000 struggled to present a smooth clear presentation. Rebecca Dimornay more recently in Wedding Crashers. A clearer presentation but notice the over saturated white suit coat. 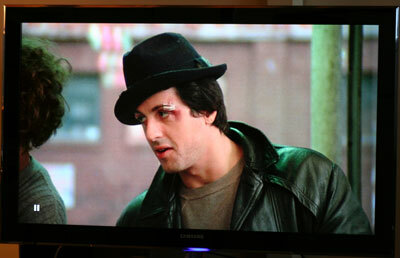 A great shot of Sly Stallone showing vivid contrast and detail from the Blu Ray release of Rocky. 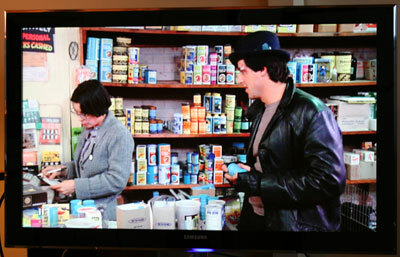 This scene from the Blu Ray version of Rocky shows detailed contrast and color information. 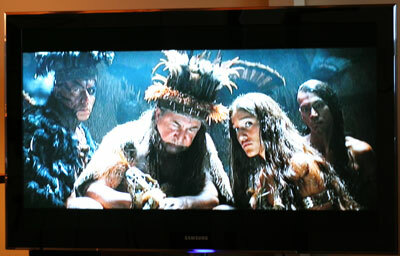 From The New World; this scene shows how saturated black and white can appear. 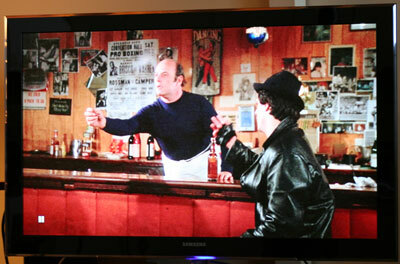 Red tones in the Lucky Seven Bar in this scene from the Blu Ray release of Rocky appear somewhat oversaturated.. Viewing Angle/Off Axis Viewing: At 40 degrees off axis contrast is significantly reduced and black levels become hazy. However, the destruction of contrast and black levels stops there, not continuing as viewing angle widens. The screen remains perfectly viewable even from 70° side angles (with the reduced contrast). Motion Lag: The UN55B8000 did a good job eliminating motion lag and judder. There was some notable jerkiness in a few scenes panning side to side with the AutoMotionPlus feature turned off. False Contouring/ Mapping: When viewing the rough 1997 version of Risky Business much false grain and mapping information was visible. This was somewhat surprising given the excellent results of the 55B8000 in processor testing (See Test Results). Remote Control/Menu Functionality: The Samsung UN55B8000 comes with 2 remote controls. One is substantial, backlit, complete and well designed with gloss black finish and every ergonomic enhancement imaginable. The remote wheel is catchy but not necessary. Clicking the edges of the wheel accomplish the same tasks as scrolling the wheel and expedites changes. This standard remote control contains a discrete button called P. Size for changing the video aspect ratio. The second pod-like diminutive remote contains a center arrow keypad for controlling basic functions; power, next channel, and volume. The TV menu is not accessible with this remote. The Menu is very attractively laid out and thorough, but slow and cumbersome to navigate. Audio Output: Sound is initially hollow as in a deep vault from the dual 15W speakers. 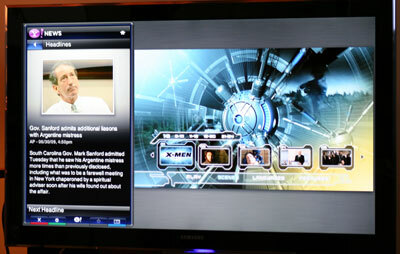 For a majority of programming changing the mode to movie, and utilizing the Clear Voice feature will help a lot to improve voice tone in DVD and broadcast material. SRS TruSurround is a useful feature for HD content but it doesnt help voice tone. Overall, we were not impressed by audio delivery from the UN55B8000. Features: The Samsung UN558000 is loaded with extra features, some surprising, others more useful. AutoMotionPlus 240Hz Refresh Rate. Samsung has increase the frame rate conversion to 240Hz on the B8000 as the one of the premium markup features. See our complete article about 120Hz/240Hz rates here. This feature is awesome on the Standard setting for sports programming and gaming. Turning it off during film and broadcast viewing will save you from the cardboard cutout soap opera effect and deconstruction of cinematography that this feature creates (in film playback). Internet Connectivity: Connect to the Internet to see Yahoo news, Flikr, twitter, Yahoo Finance, Yahoo Video and more. There is a nice picture option to compress the entire TV picture over to the side so you can see your full program while using the internet features. There was a lot of content to view on the different channels but we can't say we were impressed by the response time of the menu and though the feature itself has potentional, it feels as though it is still in it's infancy. You can make this feature wireless with an optional accessory. Price Considerations: At $3700 the UN55B8000 is not a discount TV. It demands a premium for some of Samsungs newest technology including 1.2" depth, LED backlighting, Internet connectivity, a nice heavy table top stand and remote, and one of the best looking panels we've seen. Competition hails from the Sony KDL-55XBR8 (local dimming LED backlit see review here) which sells for in excess of $4200 and measures higher in contrast. Both sets have their own advantages in certain areas so read the reviews to decide. LG has several models that will provide competition in the future in the LG 55LH55, and the LG 55LH90. The Sharp LC52E77 is a non-LED backlit lower end unit from Sharp.